The Instant Indie Collection Vol Two is designed to offer Xbox One and PlayStation owners the opportunity to build a collection of the The Instant Indie Collection Vol Two is designed to offer Xbox One and PlayStation owners the opportunity to build a collection of the very best indie games, for a fraction of the total retail price. 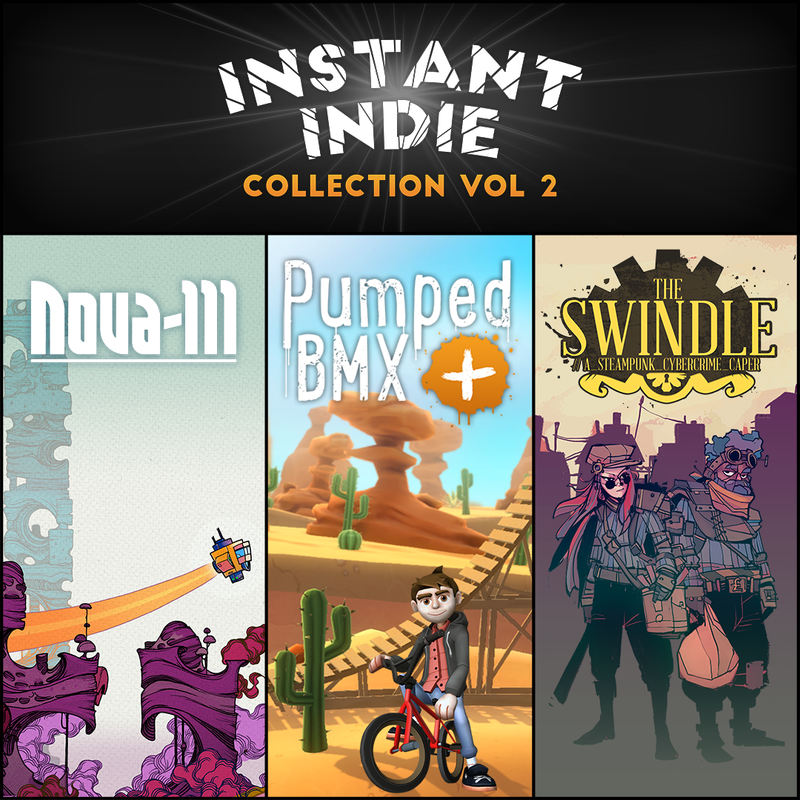 Instant Indie Collection Volume Two contains The Swindle, Pumped BMX + and Nova-111 and is available from today on the US PlayStation 4, PlayStation 3 and PlayStation Vita (cross buy) stores, tomorrow in Europe and Friday (23rd October) on Xbox One worldwide, priced £19.99/$24.99/ €24.99. The Swindle hails from developer Dan Marshall. A mixture of platform, action and stealth gameplay, The Swindle gives player access to the ultimate thieves’ guild and tasks them with breaking into procedurally-generated buildings, hacking their systems, stealing their cash and then charging to the nearest exit to the sound of alarms and breaking glass. Pumped BMX + is the latest game in the series which has captivated both the BMX and gaming communities alike from one man studio YEAHUS. Pumped BMX + takes everything that made the original game so well loved and brings it up to date for the console generation. With 50 tricky courses, a comprehensive collection of authentic ticks and 500 intense in-game BMX challenges, this truly is the ultimate Pumped experience. Nova-111 is the brain child of ex Q-Games developers Eddie Lee and Kalin, whose previous work included the PixelJunk series. Nova-111 is a sci-fi themed adventure that lets you utilise both real-time decisions and turn-based strategy to fight enemies and solve puzzles. Pilot rescue vessel Nova through mysterious and alien planets, navigate mind warping puzzles and engaging in strategic battles with bizarre astrobiological creatures. “Instant Indie is designed to allow console owners the opportunity to discover indie gems that they may have missed upon original release in one no hassle, discounted bundle.” says managing director of Curve Digital, Jason Perkins. “Volume Two showcases some of our year’s biggest hits from a variety of different genres. There is something for everyone in this bundle” very best indie games, for a fraction of the total retail price. This entry was posted in 2, Developer, game, games, Games Developer, Microsoft, Sony, train, train 2 game, Train2Game, www.train2game-news.co.uk and tagged 2, developer, game, games, Games Developer, games industry, indie games, Instant Indie Collection Vol Two, Microsoft, Nova-111, Pumped BMX +, Sony, The Swindle, train, Train2Game by Train2Game Blogger Team. Bookmark the permalink.